Take a 50-line gaming journey at Fly Casino to a place where men have honor and feathers in their caps. 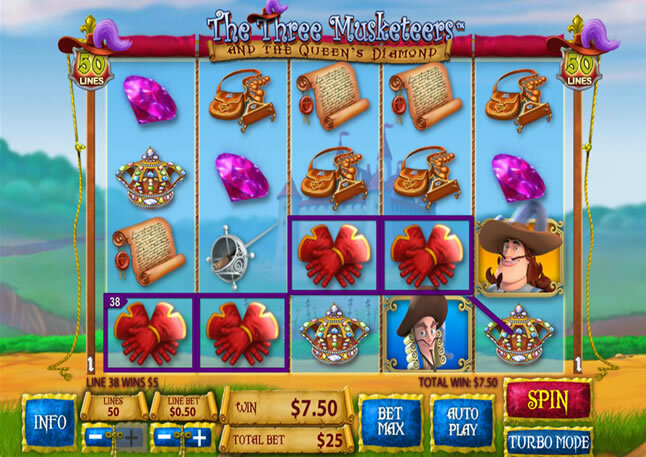 The Mighty Three Musketeers Athos, Porthos and Aramis award Re-Spins or a Cash Prize and their loyal companion D’Artagnan takes a perilous journey to find the queen’s diamond and the ultimate cash prize! There are Free Spins up for grabs if you hit Free Spins Scatters on Reels 1 and 5. You’ll win three free games for every symbol you hit. Hit Stacked Free Spins symbols on the reels and a massive 24 free spins can be yours! Meanwhile, hitting d’Artagnan bonus icons on Reels 2 and 4 triggers the Queen’s Diamond Bonus. D’Artagnan will move the reels out of the way to start the bonus round. The goal is to find the Queen’s diamond and win the big bonus cash prize in the final stage. This amazing new game at Fly Casino is filled with entertainment and great wins. Saturday April 12, 2014 00:00GMT until 23:59GMT on your first deposit of $/£/€10 or more our members are eligible for our exciting Your Choice bonus. JUST 20.00 Deposit! On Tuesday April 15, 2014 from 00:00GMT until 23:59 GMT all members on their first deposit of $/£/€20 or more will receive a 220% deposit bonus up to $/£/€220.00.